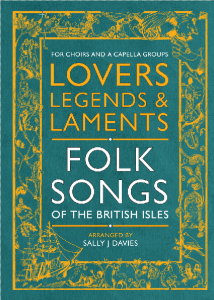 Sally has composed a gorgeous Folk Song Book for choirs and smaller a cappella groups. Optional audio tracks for rehearsals are also available both with and without the book. “Sally Davies, purveyor of harmony, musical scout and siren brings all her sonic leanings and well travelled training to approach the relatively modern idea of arranging British folk songs. She recasts the songs into exotic, expressive and connected blossoms of narrative localism whilst never losing a sense of their ‘here-and-now-ness”. In the new millennium Sally has written almost exclusively for the voice and for choirs, concentrating on arranging existing folk songs for acapella voices, specifically for the choirs which she leads. This means that her arrangements are tried and tested on both her choirs and their audiences and have proved highly popular with both. It is the interest of other choir leaders and choirs which has lead her to publish a compilation of these songs. There is a vast reservoir of songs from these islands which have survived the centuries because generation after generation they speak to some yearning of the soul. But they are sung far less often by choirs who live here than songs from other parts of the world, maybe because they are not primarily a choral tradition. So here are some compelling arrangements, perhaps with harmonies which would rarely be improvised on the spot but which still keep the songs directly within the unaffected folk tradition and still true to the deep themes in each song. I intend that you can hear the sea and the wind in the trees and that they are in turn eerie, sweet, bitter, rousing, passionate or full of pathos – and still indisputably British Isles’ folk songs. These songs will appeal to both trained and untrained singers. For those seeking complexity, there are interesting, unpredictable harmonies. But each part has a pleasing song to sing so untrained singers can learn any of the songs by ear. You can purchase the song book and/or the audio tracks for rehearsal using the button below.